In The Fortunes of Poetry in an Age of Unmaking, James Matthew Wilson demolishes the bankruptcy and pretension of much contemporary poetry and literary scholarship. Though he offers many illustrations of the sometimes hilarious absurdities that have overtaken our literary culture, he does not settle for mere criticism or mirth. Rather, Wilson's study offers us nothing less than a renewed philosophy of poetry and literary criticism, one that accounts for poetry's historical distinction as the "paradigmatic art form" and shows us a way forward to its renewal and restoration in this otherwise dreary "age of unmaking." ​Click the cover or logo to buy your copy now. Read on below for critical praise, news, and reviews about the impact The Fortunes of Poetry is having on the life of poetry in our time. The adjective “magisterial” is too frequently misapplied in the reviewing of scholarly books, but if ever a literary study merited it, James Matthew Wilson's The Fortunes of Poetry does. His subject, the history of poetry as an art form, in both its correct understanding and its misunderstandings (its "fortunes") is an important one in all cultures, and especially so in Western cultural history. Wilson has succeeded well in his purpose, which is to define the essence of poetry—what poetry historically has been and is—in the “context of a sound metaphysical realism—that [believes] human inquiry [can] arrive at the truth about being, including the being of poetry”. ​​​​I know of no book quite like Professor Wilson's, because I know of no contemporary scholar possessed of his breadth of learning and clarity of expression, who is at the same time a poet in love with the art, loving it with true intellectual passion. Wilson attempts no less for poetry than the recovery of a full range of human experience, thought, and religious faith for its content, and a clear philosophical grounding for its form. What makes his work all the more useful, indeed courageous, is that he does not dismiss the modern, or the vast fever swamps of the contemporary, but shows us where the instincts, and more seldom the conclusions, of such theorists as Eliot and Winters were true, while allowing us to "enjoy" a good measure of the banal, the hysterical, and the inept. From Plato and Aristotle to Philip Sidney and Matthew Arnold, from Bacon and Descartes to that grayest of eminences grises John Dewey, from Dante to Mallarme to Dana Gioia, Wilson shows us why we should love poetry, and why we should scorn all those who in the name of the pragmatic or even the poetic have sold her down the river of oblivion. What is poetry and what is poetry for? To ask the first question is to ask the second. To answer both questions in light of the western tradition stretching back to Homer, and against much modernist and postmodernist poetic theory and practice, is the goal of this remarkable book. Poetry’s final end is nothing less or other than to arouse in us a profound sense of wonder in coming to know, as Wilson says, that “Reality as a whole is formed as the good-world-order, the intelligible beauty showing forth from [the] cosmic circle of procession and return.” With this in mind, Wilson clearly demonstrates that poetry has become deficient not only in form but also in matter—and in logic and grammar as well. How far poets have fallen away, both in theory and in practice, from an understanding of the nature of metrical composition is the subject of this book’s earlier chapters—chapters filled with Wilson’s razor-sharp wit, skillfully employed in his analysis of what too often passes for poetry at present. 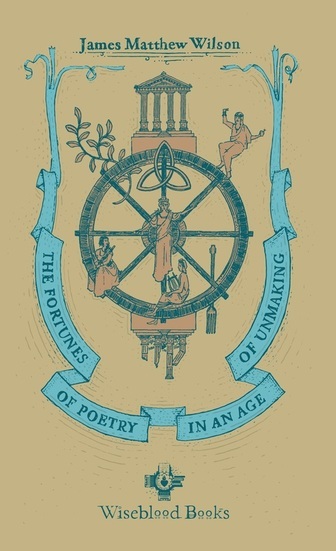 James Matthew Wilson’s brilliant new book The Fortunes of Poetry powerfully demonstrates how the evolution of Modern and Post-Modern criticism and theory, free verse, and political ideology have greatly diminished contemporary poetry. A scholar, theologian, poet, and Humanities Professor, Wilson uses his capacious scholarship and lapidary prose to apply the relevant literary history of poetry from Aristotle to Derrida—particularly how, from the Renaissance to the present, epic and narrative bowed to the primacy of the contemplative lyric. The book’s final chapter is a tour de force that compellingly argues that meter is the catalyst that joins syllables, accents and (often) rhyme to create the deeply subtle artistry of our language’s poetry. Read an excerpt from the book in First Things magazine, another in The Imaginative Conservative, and find a discussion of it by the author in Front Porch Republic. David Middleton's complete review can be found in The American Conservative. Micah Mattix reviews it in Public Discourse. Alfred Nicol reviews Fortunes in American Arts Quarterly. R.V. Young reviews Fortunes in Modern Age.